Dr. McCollister is a reflux specialist with the Minnesota Reflux and Heartburn Center at Riverwood Healthcare Center in Aitkin and Cuyuna Regional Medical Center in Crosby. 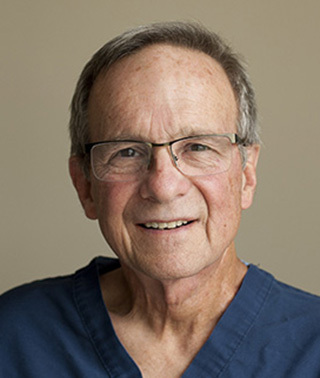 Dr. McCollister is a Diplomate of the American Board of Surgery and a Fellow of the American College of Surgeons. Dr. McCollister is a member of the American Society of Laparoendoscopic Surgeons and the Society of Gastrointestinal and Endoscopic Surgeons as well as many other medical societies. He has served on the affiliate academic faculty at the University of Minnesota Medical School as well as clinical instructor at the University of Minnesota-Duluth Medical School for 18 years. He has also served as preceptor at two institutions for the U of M Rural Physicians Associate Program (RPAP) over that period of time as well as precepting Family Practice residents for their General Surgery rotation for the Duluth Family Practice residency program. Dr. McCollister serves on a number of boards of directors and boards of trustees, including a term as director of the Minnesota Surgical Society and program chairman. Dr. McCollister, along with his partner of more than 20 years, Dr. Paul Severson, is co-director of the Minnesota Institute for Minimally Invasive Surgery (MIMIS) and through this organization has taught courses in advanced laparoscopic techniques sponsored for Category I CME by both the Minnesota Medical Association and Hennepin County Medical Center. Over the 8 years that Drs. McCollister and Severson have been teaching these courses, they have trained over 70 Midwest surgeons from 5 states in techniques such as laparoscopic bariatric surgery (lap Roux-en-Y, Lap-Band), laparoscopic nissen fundoplication and laparoscopic preperitoneal procedures such as herniorraphy and bladder neck suspension. One of the most experienced laparoendoscopic surgeons in Minnesota, Dr. McCollister was also instrumental in forming the Upper Midwest Bariatric Surgery Forum, a tri-annual meeting of bariatric surgeons from all over the states of Minnesota, Wisconsin and North Dakota.